As demonstrators across Mexico take to the streets to protest the government’s involvement in the September 2014 disappearance of forty-three students in Iguala, Guerrero, a case bearing many of the same grim hallmarks is getting renewed attention. In August 2010, the Zetas cartel abducted and killed seventy-two people pulled from buses traveling the highways near San Fernando, Tamaulipas, a town more than 1,000 kilometers northeast of Guerrero. In April of the next year, the remains of 193 people were discovered buried in dozens of mass graves in the same part of the state. Seventeen San Fernando police officers were arrested and seven indicted in connection with the disappearances. But the details of the investigation remained under wraps until last month, when the Procuraduría General de la República, Mexico’s attorney general’s office, declassified a key document detailing the government’s findings. Released under Mexico’s transparency law at the request of the National Security Archive, a pro-transparency group based in Washington, DC, the three-page memo offers a small window into the secretive workings of the country’s justice system. As in the Iguala case, federal authorities suspected that local officials helped organize the killings. We now know that those early suspicions were well grounded. Produced by the Subprocuraduría Especializada en Investigación de Delincuencia Organizada (SEIDO)—an investigative unit that focuses on organized crime—the memo describes a robust and routine pattern of narco-police collaboration in San Fernando. Captured Zetas told investigators that police acted as lookouts for the group, helped with “the interception of persons,” and turned a blind eye to their illegal activities. “I know that police and transit officials in San Fernando help the Zetas organization,” testified Álvaro Alba Terrazas, one of the seventeen police officers detained. “Rather than take detainees to the Pentágano, which is to say the municipal jail, they would deliver them to the Zetas.” Terrazas also identified two other San Fernando cops on the Zetas’ payroll. The statement excerpted in the memo does not specify which prisoners were handed over to the Zetas or why. The Zetas do not just co-opt government officials; they are also creatures of the state. Formerly secret US documents on the group, declassified under the Freedom of Information Act, together with media accounts and leaked diplomatic cables published by Wikileaks, lend credence to the firsthand accounts of police corruption described in the SEIDO memo, depicting the Zetas as a ruthless criminal organization with elite military training and an unmatched ability to compromise state and local security forces. DEA and FBI intelligence reports trace the group’s roots to former members of the Mexican Army’s Airmobile Special Forces Group (GAFE), who trained at the US Army School of the Americas in Fort Benning, Georgia, before leaving the force more than a decade ago to run security operations for the Gulf Cartel. 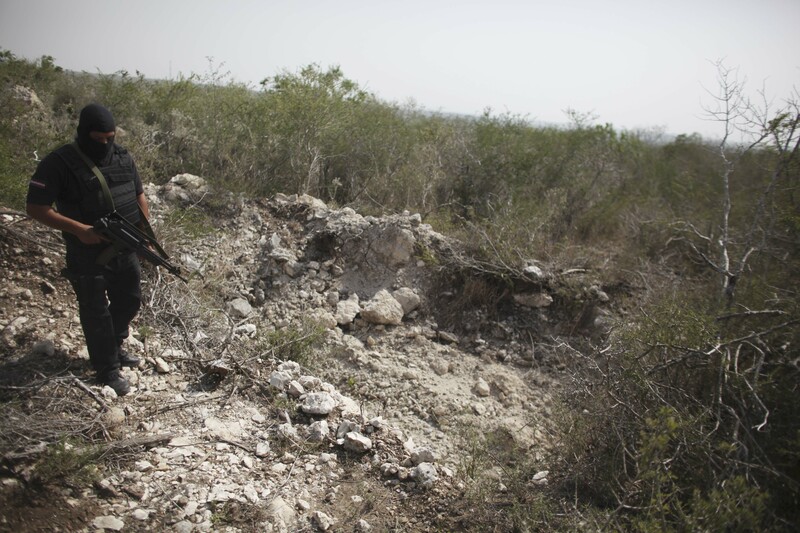 With additional training from the Kaibiles, a Guatemalan Special Forces unit responsible for grave atrocities in that country’s civil war, the Zetas ultimately broke away from the Gulf Cartel in 2010, sparking a round of gang warfare in Mexico almost unprecedented in its savagery. Diplomats at the US Consulate in Monterrey, Nuevo León, had ringside seats as the Zetas and the Gulf Cartel battled during early 2010 for control of key trafficking routes in northeastern Mexico, engulfing towns in violence and penetrating deep into local police forces. During this time, Monterrey was a “safe-haven, source of revenue (mainly from extortion), and supply center for the Zetas,” according to a consulate report from February 26, 2010, which linked the former director general of state investigation of Nuevo León and other local and state police and government officials to the Zetas and other criminal groups. In March, the Zetas launched an all-out offensive against Gulf Cartel targets in Nuevo León, turning March 2010 into what the US Embassy said was “one of the bloodiest months on record.” Narco-violence had “cut a swath across north-east Mexico,” according to the Embassy’s report. The cartels “operated fairly openly and with freedom of movement and operations” and “In many cases they operated with near total impunity in the face of compromised local security forces.” Nuevo León’s governor later suspended eighty-one state police officials after they admitted helping the Zetas put up dozens of roadblocks on roads headed north toward the US-Mexico border. Grisly photos taken in the immediate aftermath of the killings show bound and bloodied corpses stacked up against the walls of the decaying warehouse where the slaughter took place. The release of the SEIDO memo has fueled hopes for greater transparency in government investigations of the many shocking massacre cases seen in Mexico over the last few years. But it didn’t happen easily. The attorney general’s office originally refused the National Security Archive’s request to declassify information on the arrests of the San Fernando police. Citing this human rights exception, in December 2011 an advocacy group named Article 19 asked the attorney general’s office to provide a public version of its case file on the 2010 San Fernando massacre case. The Foundation for Justice (FJEDD), a legal aid organization, filed a similar case in April 2013, asking for files related to the 2010 massacre and the mass graves found, as well as a 2012 case where gangs left the dismembered torsos of forty-nine victims scattered along a highway in Cadereyta, Nuevo León. In both instances, the attorney general’s office refused to divulge the files, citing exemptions in the access law allowing the government to withhold information related to ongoing investigations. The attorney general further argued that none of the massacres had been identified as human rights violations by a competent legal authority and that the agency was thus under no obligation to make the files public. Commissioners from Mexico’s Federal Institute for Access to Information (IFAI), an independent body that settles disputes over access issues, initially sided with the attorney general’s office and said it did not have the authority to compel disclosure without an authoritative finding of human rights crimes. But a federal judge cast those arguments aside, ruling that the massacres indeed constituted human rights abuses, that IFAI did have the authority to act, and that the agency should order the attorney general’s office to release a public version of its investigative files. Most important, the court ruled that IFAI had violated the rights of the victims and their families in denying access to the information in the first place. foresaw an exception to withholding files on preliminary investigations in those extreme cases in which the crime being prosecuted is of such gravity that the public interest in maintaining the preliminary investigation files in secrecy is superseded by the interest of society as a whole in knowing of all the actions that are being brought to bear for the timely investigation, detention, judgment and sanctioning of those responsible. The attorney general has appealed the decision. But in a positive sign for transparency, IFAI reversed its position on the FJEDD and A19 cases and dropped its opposition to disclosure of the investigative files. Soon thereafter, the oversight body ordered the attorney general to release the SEIDO memo, sending a strong signal that it will not stand in the way of future appeals for human rights information. In another promising sign, this month IFAI ordered the attorney general’s office to declassify investigative files on yet another recent human rights case: the alleged torture and extrajudicial execution of twenty-two members of an organized crime group by members of the Mexican Army in the Tlatlaya massacre. The suspected involvement of police and other public servants in the disappearance of student activists at Iguala awakened Mexicans, and the world, to the continuing horrors and corrupting nature of the drug war in a way that migrant massacres far larger in number never have. Indeed, thousands of similar cases—if smaller in number—have failed to produce the kind of outrage seen after the forty-three vanished in September. In a tragic but ironic twist to the Iguala story, investigators digging for evidence in that case have uncovered the remains of at least thirty-nine other individuals whose killings were not related to the Iguala disappearances. Mexico is only now beginning to understand the scale of the violence that has plagued the country over the last decade. National Security Archive researcher Jesse Franzblau contributed reporting to this piece.